The Spiral is a contemporary office skyscraper that features a series of landscaped terraces wrapped around it. Image courtesy of BIG-Bjarke Ingels Group. The design of the tower is inspired by New York City’s classic stepped setback skyscrapers. Image courtesy of BIG-Bjarke Ingels Group. The 1,005ft-high tower will have 65 storeys and a dedicated retail space spread across an area of 27,000ft². Image courtesy of BIG-Bjarke Ingels Group. The tower is designed with interconnected floors encouraging communication at the workspace and a connected work environment. Image courtesy of BIG-Bjarke Ingels Group. The terraces on each floor will offer sweeping views of Manhattan. Image courtesy of BIG-Bjarke Ingels Group. The Spiral is a $3bn office tower being constructed by Tishman Speyer in the heart of New York City, US. 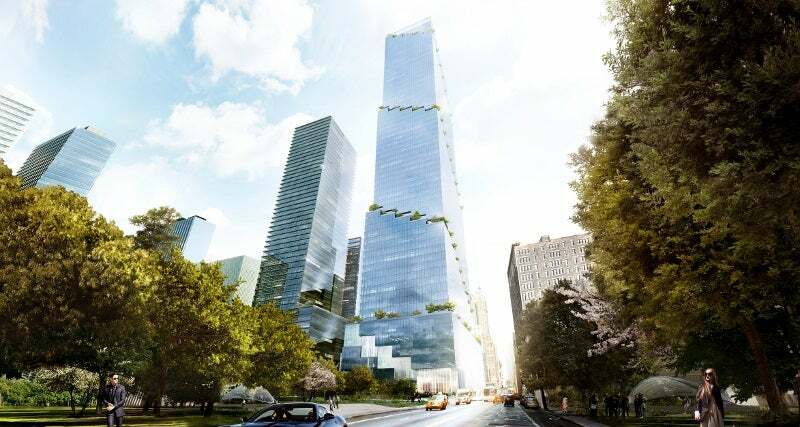 Designed by Bjarke Ingels Group, the tower will rise at the intersection of the High Line park and the newly developed Hudson Boulevard Park on Manhattan’s new western side. Covering an area of 2.85 million square feet, the tower will occupy an entire block between 34th and 35th Streets in Manhattan’s brand new commercial and cultural hub. The tower will be a part of the Hudson Yards mixed-use development that is currently under construction. "The tower will occupy an entire block between 34th and 35th Streets in Manhattan’s brand new commercial and cultural hub." Revealed by the architect in February 2016, plans for the latest addition to New York’s skyline feature a luxurious office space that promote a connected workspace for enhancing creativity, openness and collaboration. The design of the 306m (1,005ft) high-rise tower draws inspiration from a mix of historic and contemporary design styles. A unique design feature of the tower is the interlacing of a continuous green path with the workspaces on every level. Climbing in a spiral motion, the landscaped terraces wrap around the tower providing it with its signature element. The tower exhibits the characteristics of a modern high-rise in its tapering form and slender proportion while its stepping form and silhouette are a reminiscence of New York City’s classic stepped setback skyscrapers. Design of the tower includes flexible layouts with floors that open up for tenants wishing to occupy more than one floor. The development is designed with cascading terraces decked with foliage, atriums with ceilings as high as 23ft, and a glass facade. From the base to the pinnacle of the tower, the design of each floor includes access to hanging gardens and cascading atria that tie the open floor plates into a single connected work space. The 65-storey tower will provide world-class amenities that will include double-height atria, spectacular views of the city, and 27,000ft² of dedicated retail space. The retail space will occupy the building’s six-storey podium, while a large amenity terrace will be located on the seventh floor. Outdoor spaces will be available at every floor from the podium onwards. Unlike a typical skyscraper where floors function in isolation, the Spiral features interconnected floors with a ceiling height of 9m. Such spacious and intertwined setting allows occupants on different floors to freely interact with each other. Terraces on every floor will have a high atrium offering panoramic views of Manhattan, including Midtown, Central Park, the Financial District and the Hudson River. Elevated ceiling heights, floor-to-ceiling windows, and seamless indoor and outdoor spaces with lush greenery further enhance the views. The terraces can serve multiple purposes by providing a place for meetings, events and recreational activities. By connecting the different levels, the terraces provide a healthier alternative to the occupants in place of elevators and also encourage communication among the colleagues. The tower is an example of a contemporary work setting where nature is integrated with the office environment in a coherent manner. The prolific green spaces of the tower are inspired by the large expanse of newly developed green area close by, the 550-acre Hudson River park and also the final phase of the High Line elevated park. The landscape at the Spiral blends with its surroundings by extending the green space of the adjacent High Line upwards in a spiralling motion, coiled around the building, creating an upward path of green spaces. The 30ft-tall lobby of the tower will open towards the Hudson Boulevard park and offer further access to green spaces. With its emphasis on sustainable and green construction, the office tower targets LEED certification. A diversified team that includes Adamson Associates, building transportation systems service provider Edgett Williams Consulting Group, building envelope and curtain wall consultants Heintges and building systems consulting engineering firm Cosentini Associates has collaborated on the design of the tower. Other collaborators include WSP Cantor Seinuk, Neoscape, Pandiscio, Squint Opera and BIG IDEAS. Novum's mission is to produce and construct architectural structures and their enclosures for diverse clients through the application of innovative technology, excellent engineering and a strong emphasis on client satisfaction.